Do you like to spend a lot of time outside in your backyard? Do you take a lot of camping trips in the great outdoors? Are you a fan of tailgating or going to sporting events regularly? If any of this is true of you, then you need a canopy tent to keep you comfortable and protected from the elements right away! And in this article, we’ll introduce you to a great product that can do just that and much more, too: the Shade Tech Canopy 8x8 Tent. This canopy tent comes from the Shade Tech company, which is committed to excellence and great-quality products that will hold up to a lot of wear and tear. The company offers several different options when it comes to canopy tents, including straight leg varieties, slant leg varieties, and many different sizes and canopy colors, too. If you’re looking for a product that’s sure to be made of sturdy, quality materials and will be a useful addition to your next outdoor event, you can’t go wrong getting something from the Shade Tech company. Although this company makes lots of products, we’re going to be taking a look at their 8x8 straight leg tent below, which is one of the best products from their lineup for tailgating purposes. Check it out and see for yourself what a difference it’s sure to make in your next outdoor experience! The Shade Tech Canopy 8x8 Tent is a sturdy and secure mid-sized canopy tent with straight legs that’s perfect for use at most outdoor events. It is built from an aluminum frame with a polyester fabric top that’s designed to be weather-resistant and long-lasting as well. The canopy itself is stitched for durability and is designed to be easy to set up and take down as needed. If you’re looking for enough space for a couple of adults or a few kids to relax outside in the shade, this tent is the way to go. This tent has a lightweight aluminum frame that is designed to be resistant to rust and other weather-related damage. The polyester canopy fabric is also designed to hold up to use in inclement weather without becoming damaged in most situations. 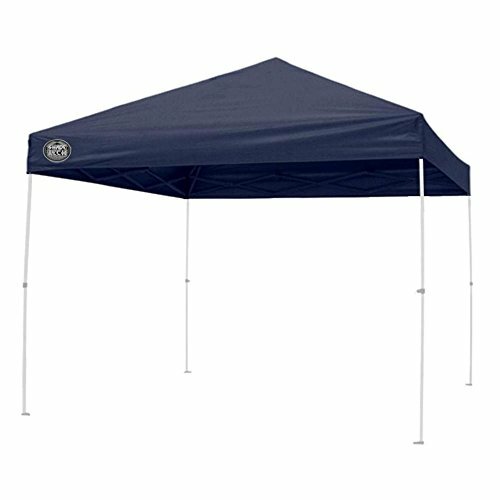 The tent is only available in a dark navy blue color, which is neutral enough to match most events and situations. The tent has a traditional straight-leg design with a high center ceiling that makes it less likely to be picked up or blown over by the wind and keeps things a little more breathable inside, too. One of the best features of this canopy is its size. It’s not as large as some of the other options out there, but it’s not so small it can’t be comfortably used, either. It’s ​​​​pretty much the perfect size for tailgating and sports viewing alike, and though it’s not big enough for large backyard potlucks, it is plenty large enough for a few adults or a handful of kids to enjoy together. It can be tough to find canopy tents that aren’t 10x10 sizes, and it’s even harder to find straight leg versions of this size of tent. Therefore, we feel that the tent’s size is one of its strongest qualities. We feel that the biggest downside of this tent is its thinner and less durable frame than some of the others out there. Although the product is still quite sturdy overall, the aluminum frame on this particular canopy tent model is less secure than some others on the market, and therefore the tent stability may suffer somewhat because of this. If the frame could be reworked to have a little bit more support overall, it would be a great product that would be a lot less prone to breaking or being blown over by the wind. Of course, then weight and portability becomes an issue, so it's really dependent on your individual needs. The canopy is very lightweight and can be taken along on just about any type of trip with ease. This canopy does not usually arrive with damage to the frame or canopy from shipping or storage. When it’s folded down, the canopy is easy to store without taking up too much space in your garage or storage building. Although this is a slightly smaller tent than the more standard sizes out there, it still provides ample space for several people to comfortably fit beneath it without having to be overcrowded. The tent may be challenging to put up and take down without help from another capable adult, although having two people should make it a fairly easy process. The tent may be prone to blowing over in the wind or becoming damaged by heavy storms and other bad weather. This canopy tent doesn’t come with any stakes, ropes, or sandbags to help secure it in place, so you’ll need to buy all of this separately if you want any of it. The tent doesn’t seem to come with any sidewalls or hardware for installing sidewalls, so this will be an extra expense as well. So what do you think? Are you read to run out and grab your new 8x8 size straight leg canopy tent from Shade Tech right away? This tent is sure to make your next party, tailgating event, or camping trip that much more comfortable and safe, too, so be sure to bring it along to get all the best possible benefits form having an item like this one in your outdoor gear collection. You and your whole family will enjoy the shade and comfort of sitting beneath this great canopy. And if you’re looking for something a little bit larger to suit a bigger family or more additional gear, don’t worry—Shade Tech has you covered there, too! The Shade Tech company offers canopy tents in several different sizes, including the traditional 10x10 and the larger 12x12 options too. Don’t forget to pick between straight leg and slant leg varieties to help you find the right fit for your specific needs as well. No matter which one of these great high-quality tents you choose, you’ll be well on your way to a better time outside as soon as you get your new product set up and ready to go!